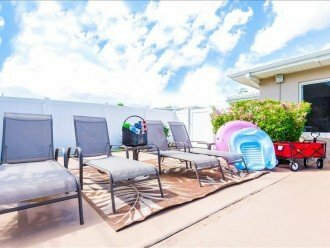 4 Bedroom House Rental in Lauderdale-by-the-Sea, FL - Coco Palm Escape: 5 Min Walk to Beach, 5 Star Home, 4/2, Heated Salt Water Pool! Welcome to Coco Palm Escape. In an effort to answer guest's FAQs and facilitate easier shopping and online bookability for you, we have crafted this first paragraph to our description so you may find the answers you need quickly and enable you to have confidence to book online now. FAQ 1: Is this house available for my dates? Answer: This property is managed by a professional software that keeps calendars up-to-date, in real time, as bookings occur across all of our advertising platforms. If the calendar you are viewing says it is open for your dates, than it is accurate! FAQ 2: How much will my stay cost? Answer: Our professional software keeps our prices accurate at all times. If you would like to see a quote, simply put in your dates on the website you are viewing and it will present you with an accurate quote. POOL HEAT: Please note: Pool heat is not included in the pricing, unless you see it reflected in your quote. Pool heat is an optional amenity. If guests would like the option of pool heat, it would be roughly $33 a day (this includes tax). 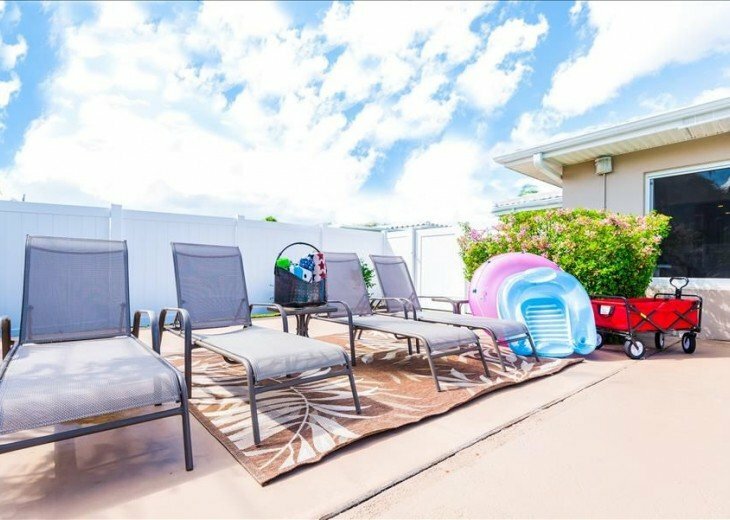 Please let us know if you would like to add pool heat as soon as you book the home. FAQ 3: What are the bed/bath layouts in this home? 1st Bedroom: Master Bedroom: King bed. Small, private en suite bath with stand up shower. 3rd Bedroom: Two full beds, each with additional twin trundle underneath. 4th Bedroom: Queen bed (this room is small but very comfy and private ... perfect for the family member who wants a bit more privacy or to double and the kids' private TV/play area). Additional Sleeping Options: 1. Air Mattress. 1st Bathroom: Private en suite bath with stand up shower. 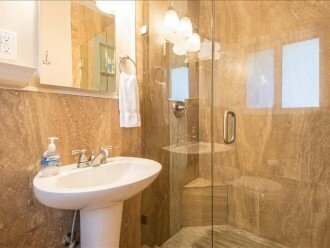 2nd Bathroom: Bedrooms 2 ,3, and 4 share a new travertine bath with tub/shower combo. - No events, parties or gatherings of any kind at this property. - Must be at least 25 years of age to book. - Only four cars are allowed parked at this property at any given time. 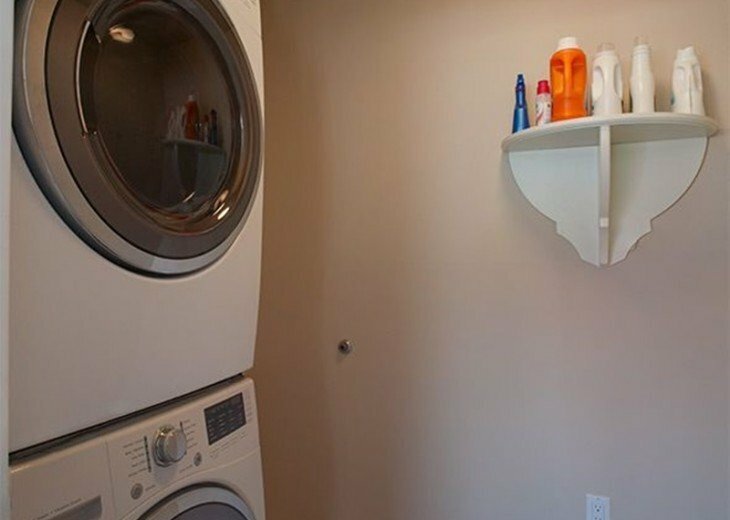 Extra Amenities: Please note that this house includes several bikes for our guests to use free of charge. For your convenience, they are stored in the garage. "A complete high end renovation of this beautiful home was completed in December 2014. Located steps from the ocean in the quaint village of Lauderdale by the Sea this elegant retreat ensures comfort and entertainment for families, friends or business travelers alike. 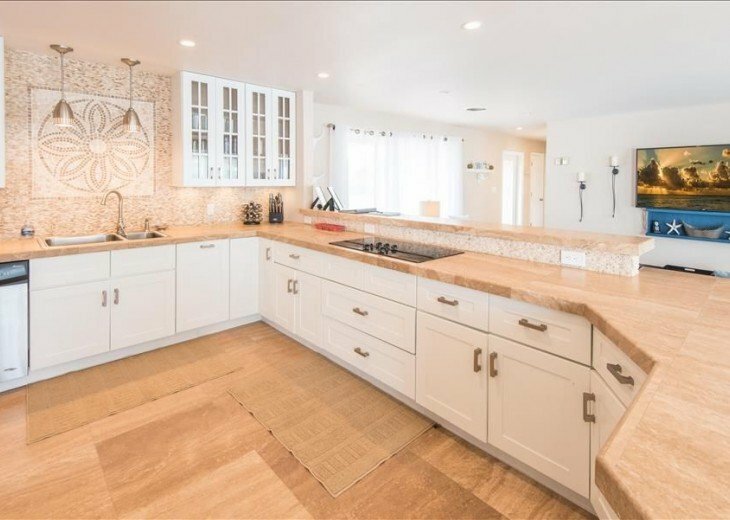 It has a perfect location in the upscale community of Bel Air and has a tasteful, contemporary layout that offers the ultimate in both privacy and convenience. Those whose idea of the perfect vacation involves a swimming pool will be thrilled here!! This pool is absolutely enormous ...gigantic, in fact ... and gets all day sun. Optional pool heating is also available for 30 a day. New and beautiful patio furnishings can accommodate many around the pool area. 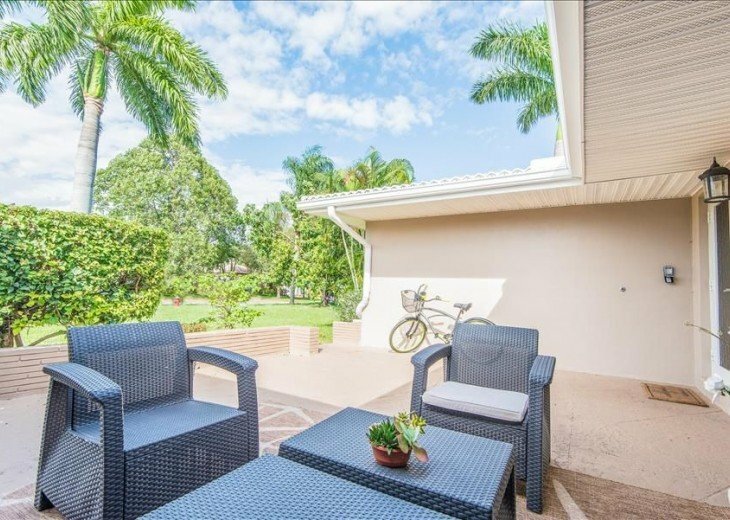 But for those who prefer a quiet, shady spot to escape the action in the backyard, a private, comfortably-furnished front porch is waiting for you. The bright, open living area of the home has lots of seating and provides the perfect place for togetherness. Play some foosball on the new table or enjoy the internet-connected giant 65 inch 'smart' flat screen TV while enjoying the company of family or friends. Those who prefer a secluded corner with a good book will find plenty of those options too!In the brand new, fully equipped kitchen, guests will find all that is needed to create elaborate meals at home. No shortage of china, cookware or other convenience items in this house! The 36 inch cooktop, large capacity fridge with icemaker, wine chiller and other kitchen amenities make dining in easy. Of course, vacationing in Lauderdale by the Sea is especially desirable because of the huge number of awesome eateries in close proximity so guests will want to be sure and visit some of those as well. The Village offers wonderful opportunities for dining and entertainment, from casual to elaborate. The bedding configurations allow sleeping options that most other homes of similar size do not. Though occupancy is limited to 10 guests, there are actually comfy beds for up to 12 which allows for choices in arrangements. All bedrooms have brand new high end mattresses, with extra thick memory foam mattresses on the kings and luxury euro-plush mattresses on all others. Quality linens, new furnishings and huge new 'connected' flat screen TVs are present in each bedroom as well. 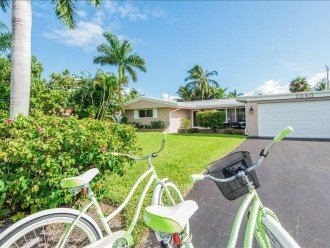 This home is just a few minutes walk (less than one-half mile) from one of the most beautiful stretches of pristine beach in South Florida and mere steps from Intracoastal Waterway. A shopping center with grocery store, drugstore, restaurants, markets, bank and other conveniences is one mile away while the center of the village of Lauderdale by the Sea just a pleasant 1.3 mile stroll. For those who prefer to ride, the Pelican Hopper (a free local hop-on/hop off shuttle service), passes by frequently and offers transport to beach, shopping center and Lauderdale by the Sea town square as well as to connection points for the famous Water Taxi and the Broward County public transportation system. Most vacationers will find that a car is just not necessary from this property. Home Includes: appliances, linens, towels, basic toiletries, dish/laundry soap, washer/dryer, hot water, dishwasher, high chair and pack-n-play. Wifi and Cable TV. Beach cart, beach chairs and cooler also furnished. Great Deal, Awesome Home, Perfect Location!!"